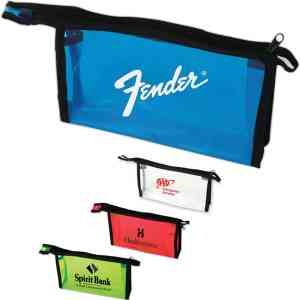 An economical and practical promotional product that provides additional visibility for your logo! Featuring a black zipper with black fabric edging the PVC bag is constructed from 20 gauge vinyl and available in 4 vivid colors. Add your custom imprint to these ideal promotional bags and hand them out as tradeshow giveaways or fill with goodies and give as gifts to your valued customers and dedicated employees. Great for promoting any business! Size: 7 " x 4 1/4 " x 1 1/2 "